Juniper (Juniperus communis) is an evergreen shrub found on mountains and heaths throughout Europe, Southwest Asia, and North America. The tree grows to a height of 6-25 ft (2-8 m) and has stiff, pointed needles that grow to 0.4 in (1 cm) long. The female bears cones that produce small round bluish-black berries, which take three years to fully mature. Juniper belongs to the pine family (Cupressaceae). Juniper has diuretic, antiseptic, stomachic, antimicrobial, anti-inflammatory, and antirheumatic properties. The tree’s therapeutic properties stem from a volatile oil found in the berries. This oil contains terpenes, flavonoid glycosides, tannins, sugar, tar, and resin. Terpinen-4-ol (a diuretic compound of the oil) stimulates the kidneys, increasing their filtration rate. The flavonoid amentoflavone exhibits antiviral properties. Test tube studies show that another constituent of juniper, desoxypodophyllotoxins, may act to inhibit the herpes simplex virus. 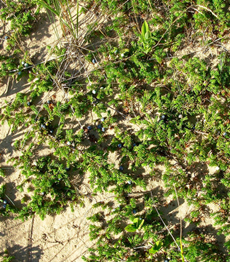 In addition to being an ingredient in alcohol, juniper also has medicinal properties. Ancient Egyptian doctors used the oil as a laxative as far back as 1550 B.C. The Zuni Native American people used the berries to assist them in child-birth. Other Native Americans gathered juniper berries and leaves to treat infections, arthritis, and wounds. British herbalists used juniper to promote menstruation. Nineteenth-century American herbalists used juniper as a remedy for congestive heart failure, gonorrhea, and urinary tract infections. Juniper has also been used as a traditional remedy for cancer, arthritis, gas, indigestion, warts, bronchitis, tuberculosis, gallstones, colic, heart failure, intestinal disease, gout, and back pain. The berries were often eaten to relieve rheumatism or to freshen bad breath. 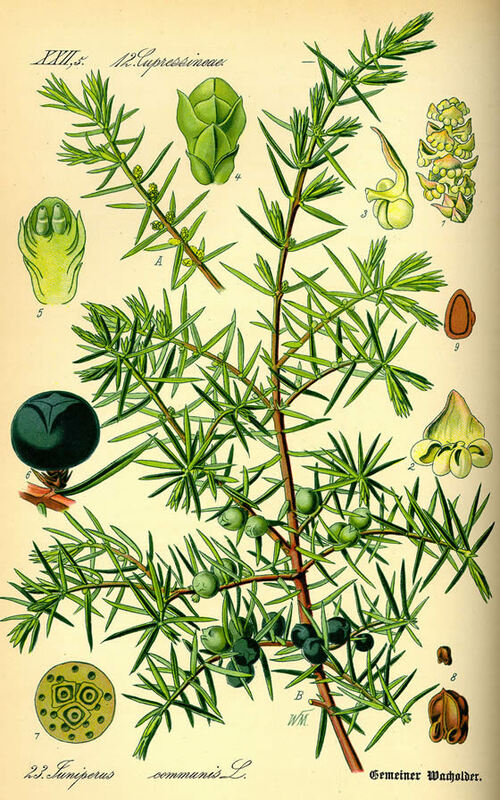 When treating patients, doctors often chewed juniper berries to prevent infection. Modern herbalists prescribe juniper to treat bladder infections, kidney disease, chronic arthritis, gout, rheumatic conditions, fluid retention, cystitis, skin conditions, inflammation, digestive problems, menstrual irregularities, and high blood pressure. The German Commission E has approved juniper berries for use in treating heartburn and dyspepsia (indigestion), belching, and other digestive disturbances. Juniper is a powerful diuretic. The volatile oil contained in juniper is composed of compounds that stimulate the kidneys to remove fluid and bacterial waste products from the body. This diuretic action is useful in such conditions as congestive heart failure, urinary infections, and kidney disease. The oil also has antiseptic properties, which makes it a useful disinfectant treatment for urinary and bladder infections. The German Commission E reported that juniper caused an increase in urine flow and smooth muscle contractions. Juniper may be combined with other herbs such as uva ursi, parsley, cleavers, or buchu to treat bladder infections. In fact, juniper may help treat bladder infections more effectively when combined with other herbs. Juniper’s anti-inflammatory properties help to relieve the inflammation, stiffness, and pain that are present in conditions like arthritis, rheumatism, and gout. The berries can be made into an ointment and rubbed on the affected joints and muscles. The tree needles may be crushed and added to a bath to ease aching muscles. Some people may find relief from the nerve, muscle, joint, and tendon pains of gout and rheumatoid arthritis by applying a compress made from an infusion of juniper berries. Juniper is also warming to the digestive system and increases the production of stomach acid, stimulates the appetite, settles the stomach, and relieves gas. A steam distillation process is used to extract the essential oil of juniper from the ripe dried berries. This aromatic oil has a light, fruity fragrance that is psychologically uplifting during periods of low energy, anxiety, and general weakness. Applied topically, essential oil of juniper has a warming effect on the skin and helps to promote the removal of fluid and waste products from tissues. External applications also help relieve sore muscles, joint and lower back pain, and can be used to clear up acne, eczema, and varicose veins. To stimulate menstruation, juniper oil can be added to a carrier oil and used in a sitz bath or massage. Steam inhalation of the essential oil may also help relieve coughs and lung conditions such as bronchitis. Consumers should use juniper oil sparingly and should not use more than the recommended dose. Six or more drops of juniper oil can have a toxic effect. Any aromatherapy essential oil should be diluted in a carrier oil such as almond or grapeseed oil before external use. The ripe, berries and needles from the tree are used in herbal medicine. 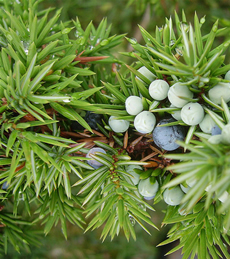 Juniper is available in bulk form as whole berries, or as a supplement in the form of capsules or tinctures. The recommended tincture dosage is 10-20 drops four times daily. Teas are often taken to relieve digestive problems. To make a tea, 1 cup of boiling water is poured over 1 tablespoon of juniper berries. The mixture is covered and steeped for 10-20 minutes. One cup can be drunk two times daily. The tea should not be used for longer than two weeks at a time. A clean cloth may be soaked in the cooled mixture to create a compress. Juniper should be used only for short periods of time. High doses or prolonged use of juniper may irritate the kidneys and urinary tract, causing damage. People with kidney problems should not use this herb. Juniper stimulates contractions of the womb. Pregnant women should not use juniper. Breast-feeding women also should not use juniper. Juniper may increase blood sugar levels in diabetics. Therefore, diabetics should consult with their doctor before using juniper. When taking juniper for a bladder infection, consumers should see their doctor if the infection is still present after several days of use, or if lower back pain, fever, or chills develop. External application of juniper oil may cause a skin rash. People with allergies may experience allergy symptoms such as nasal congestion. 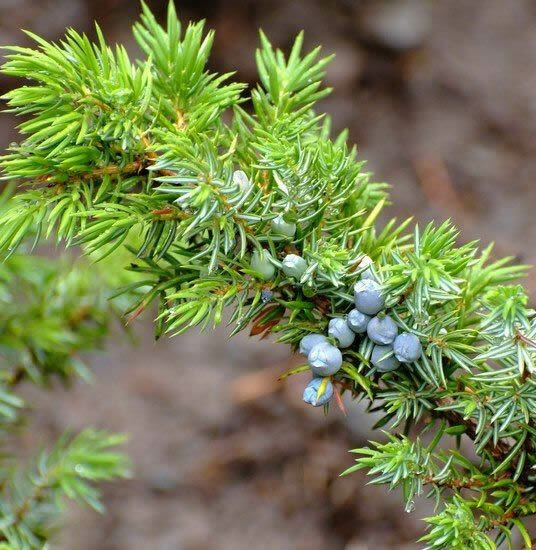 Symptoms of juniper overdose include diarrhea, purplish urine, blood in the urine, kidney pain, intestinal pain, elevated blood pressure, and a quickened heartbeat. If these effects occur, consumers should stop taking juniper and call their doctor immediately. Consumers should use juniper cautiously with other diuretic drugs or substances because excessive fluid loss may occur.